I was recently asked why did I reduce the number of outfit posts on the blog? Why did I diversify into Lifestyle blogging? So I thought a blog post was a good place to answer that. Firstly I didn't start out as a 'fashion blogger'. I didn't start out as a blogger, at all, actually! When I had started, I truly believe I was just writing (like an online journal). I was sharing and exploring a medium of self expression. I just needed something to do. It was not until almost after a half an year of writing did I realize that I was indeed blogging and there are many others who blog about different things and topics. 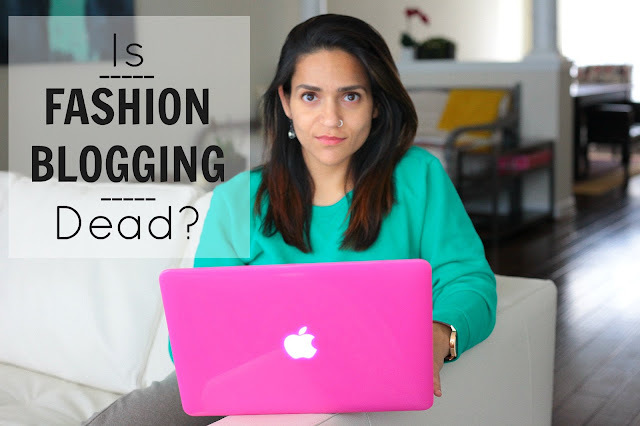 In December 2009, I stumbled upon a few fashion blogs and my world was forever changed. I remember, it was during the holidays when I spent several days (and nights) browsing through one fashion blog after the other. Then on Christmas Day, I asked my husband to take my first outfit pictures in a parking lot outside the cinemas with a basic point-and-shoot camera (we had gone to see - Sherlock Holmes). And rest, as they say, is history! I was never "just" an outfit blogger. I intermittently blogged about fitness, food, and everything else in between. But last year I took a conscious decision to reduce outfit posts from thrice a week to once a week, for several reasons. Firstly, I never really took clothes and fashion that seriously to begin with. Sure I like dressing up every once in a while, and appreciate people with style but I am not (and never will be) a clothes horse. Secondly, I had a business back then which I was trying to grow and it required me to give it more time than the blog. However, even when I decided to close down my business, instead of going back to three outfit posts, I decided to explore my other interests and passions. As many fashion bloggers and other industry experts have said, and I agree with them, fashion blogging is becoming a new "Vogue", a platform to try and get people to buy more, spend more, want more ... and (some times) set unrealistic standards for women. Of course not every fashion blog can be categorized in the same way but it is definitely getting harder to differentiate one blog from another. I do not want my blog to be lost in the haze of 'just another fashion blog'. I do think that fashion blogging has already past it's peak. Sure there will still be some style super stars, but most women are influenced by each other. Every unique idea gets beaten-down till it becomes main stream. There are only so many ways in which clothes can be worn, and someone somewhere has probably already done that. The only thing left is your personality. If you have the courage you show who you are, you might still stand out but if you plan to just get clothes and wear them how the next person is too, then you are probably going to get lost in the big-bad-world of Internet. Or at least that's what I think! I think you also have to credit your evolution as a woman, wife, blogger that probably has got you to this point of exploring your other interests and talking about it with your audience- right? It's all about growth so YOU GO GIRL!!! On the hand, I also think the face of fashion blogging has changed to dramatically. It's a saturated space and somehow it's hard to stand out. Personally I love to learn more about a blogger through all the different topics they discuss, it gives you a better sense of who they are... The clothes- sure they are pretty and inspirational but the times they are a-changing. PLUS I am all about having a lean closet. You've always been a lifestyle blogger to me with a mix of fitness, fashion, and travel. Do what you love dear! I agree, you shouldn't limit your creativity to only fashion especially when you love writing. Fashion doesn't only mean wearing fancy clothes, it portrays once personality and writing about varied topics will help both the blogger and readers to explore those. But I can't agree with you statement that fashion blogging is dead. I don't really think so, trends change and they also repeat every year, what I look in a fashion blogger is how uniquely they style those pieces and I don't think the way you can wear a single piece multiple ways can ever reach it's peak. That's what I think! Yes, this is practically true. Fashion blogging has passed its peak. I still love seeing beautiful clothes and I still wearing beautiful clothes on my blog, but there are many times when there's only so much you can say about clothes -- as the one writing the post and as the one commenting on someone else's. That's why my blog has never been just a fashion blog. I like to talk about travel and books and movies, too, because I simply couldn't talk fashion all the damn time. My sentiments exactly. I love fashion and I've studied the subject in great detail as well. However, I knew I didn't want to be just another girl wearing borrowed or sourced clothes and clicking fancy pictures kind of fashion blogger (not that there's anything wrong with it) and I'm certainly not getting any younger, because the current fashion space around me is occupied by a majority of young women who cannot consume alcohol legally. So I felt I needed to go my own way and create my own space and do what I do best, which I did, with my travel and cocktails and lesser fashion stories. It's a lot more fulfilling too. Yes, just like blogging in general, I think life gets in the way. Some people are less passionate about it at a later stage in their life, while others have something new to occupy their time with. I don't think I could agree with this post anymore than I already do! It's basically everything I've been thinking about blogging, which is probably why I've become so distant from my blog. While mine definitely started out as a fashion blog, over the years I too have really minimized my closet. Now I only pick out basic, classic pieces that I wear over and over again. I don't have a slew of random clothes, neither do I want that. While I still love dressing up, I've also started being inspired more by food, health, fitness, and home decor. I always love coming to your blog because you're so real and speak your mind. Plus, you have such great thoughts on topics that interest me. It's refreshing, and I'm so glad I'm not the only one that feels that fashion-blogger burn out!